PORTSMOUTH V SCUNTHORPE UNITED. 16.03.2019. 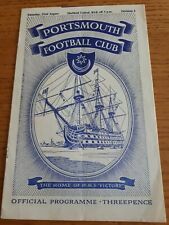 PORTSMOUTH V SCUNTHORPE UNITED. DIVISION ONE. 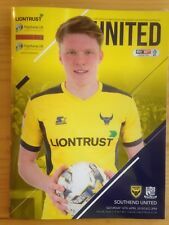 The money raisedwill go to OUFC's Yellow Army fund. 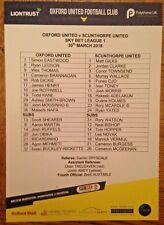 Mint Condition Official Team-Sheet for the League 1 Match Between Oxford United & Scunthorpe United - Played March 30th 2018. This is an A5 sheet. 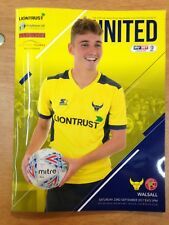 The money raisedwill go to OUFC's Yellow Army fund. 65 YEARS OLD ! GOOD CONDITION - NEAT SCORE DETAILS ON TEAM LINE-UP PAGE. 64 YEARS OLD ! GOOD CONDITION - V.SL.PIECE OF CELLOPTAPE ON SPINE - NO PEN MARKS - NO WRITING. 64 YEARS OLD ! GOOD CONDITION - 1 TC = 1 TEAM CHANGE ON TEAM LINE-UP PAGE. 62 YEARS OLD ! GOOD CONDITION - RS = RUSTY STAPLES - NO PEN MARKS - NO WRITING. TOM FINNEY. 66 YEARS OLD ! GOOD CONDITION - RS = RUSTY STAPLE - 1 TC = 1 TEAM CHANGE ON TEAM LINE-UP PAGE. 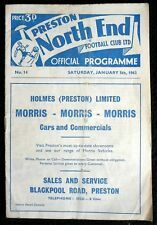 Preston North End v West Bromwich Albion - League Division 1 - 31/01/1959 at The Deepdale Ground. Fair condition due to wear to spine (see scan) clean, no writing on the team sheet page. Not rare but hard to find horizontal fold no writing. PETERBOROUGH UNITED v BRISTOL ROVERS. ALL ORDERS SENT OUT IN HARD BACK ENVELOPES. Preston North End v Tottenham Hotspur - League Division 1 - 25/04/1959 at The Deepdale Ground. Very Good/Good condition (see scan) clean, no writing on the team sheet page. Good condition: writing - see photos. The money raised will go to OUFC's Yellow Army fund. 1946-47 First Division Matchsheet. Portsmouth v Sunderland. No writing and no bends/creases. no marks/stains, no rust to staples. 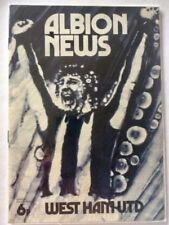 there is a picture and write up of the SOUTHAMPTON squad also a full page pic of BARRY BRIDGES. FOOTBALL LEAGUE DIVISION ONE. Portsmouth v Stoke City, 1946/47 - Division One Match Programme. Portsmouth v Stoke City. Condition: Slight handling creases / marks and ragged edges (caused slight nicks / tears - see pictures. Splits to spine (approx. 3.5cm / 1.5cm (x3) in length - see pictures). ). 16 pages, no writing, clean staples, no bends/creases.has a pic/profile of the Southampton squad. Division One. 1946-47 Division 1 Matchsheet. Portsmouth v Stoke City. Date 12 OCTOBER 1968. RARE OPPORTUNITY! 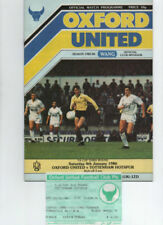 QUEENS PARK RANGERS V WEST HAM UNITED. Date 11 JANUARY 1969. RARE OPPORTUNITY! 10 x Bolton Wanderers - Premier League - 2003/2004. 13 x Notts County - League Two - 2008/2009. 12 x Bolton Wanderers - Premier League - 2007/2008. 9 x Shrewsbury Town - League Two - 2008/2009. 10 x Bolton Wanderers - Premier League - 2004/2005. 6 x Oldham Athletic - League One - 2001/2001. 6 x Oldham Athletic - League One - 2005/2006. 5 x Walsall - League One - 2009/2010. 5 x Dagenham & Redbridge - League Two - 2009/2010. 4 x Preston North End - League One - 2000/2001. VERY GOOD NO STAPLE NO WRITING.